Providence College’s commitment to stormwater management and protection of the area’s natural waterways continues to draw the attention of environmental agencies in the community. 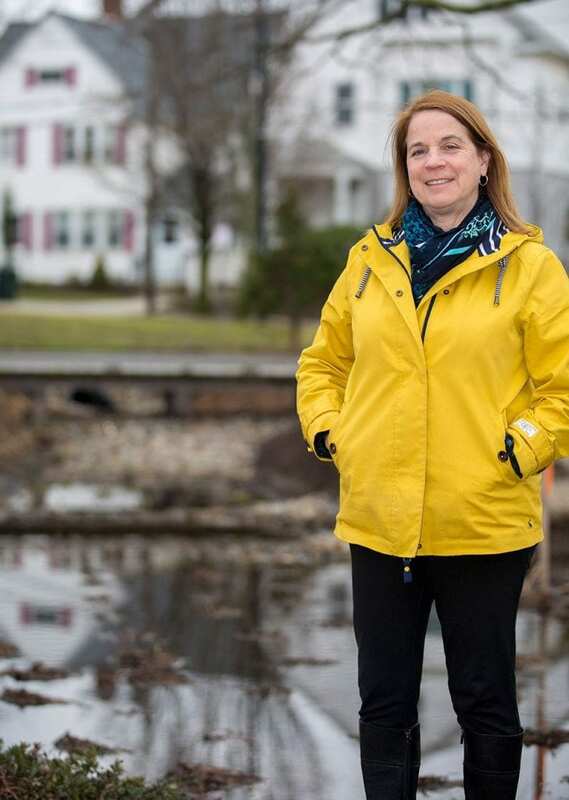 Clean Water Action Rhode Island recently recognized Gale Gennaro, a leader of the College’s Stormwater Master Plan, with its Institutional Leader of the Year award. The honor is the third acknowledgement of environmental stewardship in the last four years. PC received the Narragansett Bay Commission’s Environmental Merit Award and Save the Bay’s Environmental Achievement Award for stormwater management in 2013. Gale Gennaro has led PC’s stormwater management planning since 2010. The Institutional Leader of the Year award was presented to Gennaro for managing PC’s nature-based solutions to stormwater management and for ensuring stormwater efforts are sustained, specifically as new campus projects are planned. Gennaro, who is the director of environmental compliance, health, and safety, was honored at Clean Water Action’s annual Breakfast of Champions. Gennaro, who has worked at PC for 20 years, manages the environmental and safety programs and oversees subcontractor safety for new construction on campus. She began work in stormwater management in 2010, leading a team that implemented a campuswide Stormwater Master Plan to support the 2015 Campus Master Space Plan. Bioswales, sometimes referred to as rain gardens, are sloped drainage sites that allow trapping of pollutants before water leaves campus. The Stormwater Master Plan outlines stormwater management strategies customized for anticipated campuswide development projects and green infrastructure objectives. 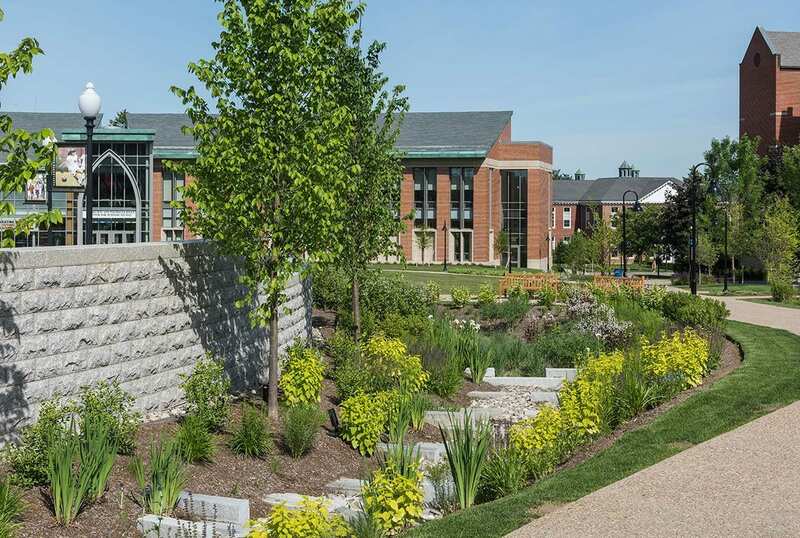 The plan frames sustainable practices for reducing campus stormwater runoff — a statewide compliance issue mandated by the Narragansett Bay Commission. A living document, the plan also incorporates a process for tracking results against established stormwater reduction goals. According to PC’s stormwater plan, contaminated stormwater is the leading cause of water surface damage in Rhode Island and harms ecosystems through the distribution of sediment, bacteria, and other pollutants via storm drains that empty into freshwater and saltwater environments. Stormwater runoff from campus drains into the Moshassuck and Woonasquatucket rivers — two waterways less than a mile from campus — which are on the R.I. Department of Environmental Management’s impaired waters list. Stormwater can have devastating effects not only on fish and other wildlife which live in, on, or near these waterways, but also on public health and the state’s economic sectors dependent upon fishing, recreation, and water transportation. PC’s mitigation efforts focus on stormwater volume reduction, water quality improvement, flood protection, and pollution, sedimentation, and erosion control — the last of which includes development of 18 bioswales. The College has achieved plan goals by incorporating best practices into future projects and by retrofitting areas to comply with new standards, said Gennaro. College officials note that plan Implementation has added to the campus’ academic and aesthetic value through the creation of wildlife habitats that are used for classroom instruction and gardens from which plants are used in laboratory classes. That is in keeping with College efforts to combine environmental compliance with support for its academic mission, as these outdoor spaces act as labs for science programs and places for art students to capture still-life images, they say. “We’ve increased our green footprint and created beautiful habitats for the students to learn and work in, and for the public to enjoy,” said Gennaro. Before coming to PC, Gennaro, a Barrington, R.I., resident, worked for 10 years as a senior environmental scientist for Halliwell Engineering in East Providence, R.I., and, previously, as a geologist in Louisiana and Iowa. She holds a bachelor’s degree in geology from Binghamton University in New York.